Because the preparation of these two dishes is so similar I decided to put them both into the same posting. The outcomes are very different, though, and I can't imagine I would ever serve both at the same meal. Rinse the beans in the perforated part of a steaming device while bringing water to a boil in the base of the saucepan. When the water is boiling rapidly, place the beans above the water line and cover the pan tightly. Turn the heat down so that the water boils at a fast simmer, and set the timer for 4 minutes. Fill a large cup or mug with ice water. After exactly 4 minutes' steaming, remove the beans and rinse them under cold running water until they are cool enough to handle. Then pour the ice water over them and allow them to drain. Refill the cup with ice water. Bring to the boil approximately 2 l (or 2 quarts) of water in a medium size saucepan. When the water is boiling rapidly, introduce the soba noodles into the pan. Immediately add enough ice water to bring the water in the pan to just below boiling point. Turn the heat down and set the timer for 4 minutes. Stand over the pan for the full 4 minutes, making sure that the water is just below boiling, i.e., swirling around but never producing significant bubbles. After exactly 4 minutes' boiling, pour the noodles into a colander and rinse them under cold running water until they are cool enough to handle. Then pour the rest of the ice water over them and allow them to drain. Remove any ice that may have gone into the colander. Drizzle the noodles with sesame oil and toss them, or turn them with tongs, to coat every noodle with a light layer of oil. This not only adds taste, but also prevents them from sticking together. 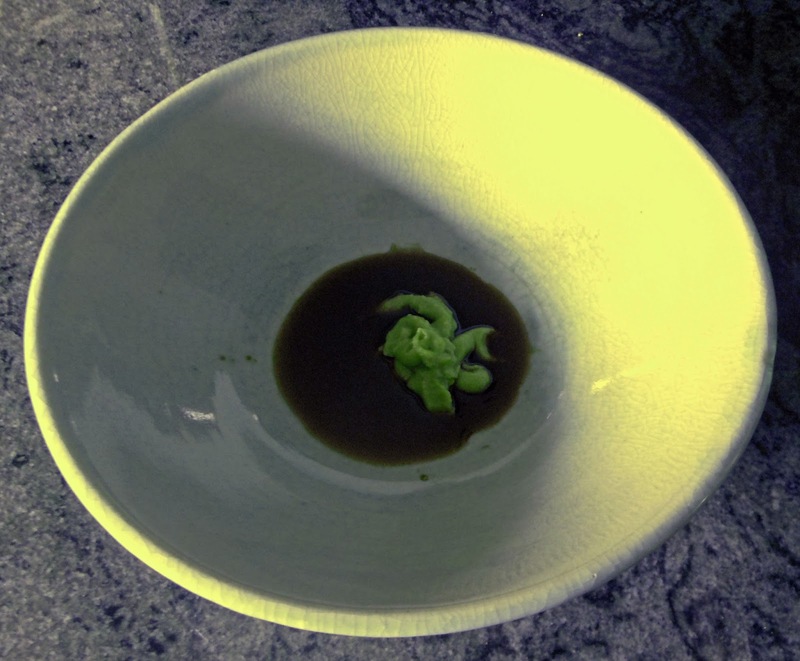 Place the wasabi paste and the soy sauce into a serving bowl and mash them together until they form a thick sauce. Place the beans and the soba into the serving dish and toss or turn them until the sauce is dispersed throughout the dish. Remove the central stem of the cauliflower and cut or break the rest into bite-size florets. Rinse the cauliflower in the perforated part of a steaming device while bringing water to a boil in the base of the saucepan. When the water is boiling rapidly, place the cauliflower above the water line and cover the pan tightly. Turn the heat down so that the water boils at a fast simmer, and set the timer for 5 minutes. Remove the cauliflower from the steam and set it aside. Meanwhile, fill a large cup or mug with ice water. After exactly 4 minutes' boiling, pour the noodles into a colander and rinse them briefly under cool running water and allow them to drain for a minute or so. Drizzle the noodles with olive oil and toss them, or turn them with tongs, to coat every noodle with a light layer of oil. This not only adds taste, but also prevents them from sticking together. Place the pesto into a serving bowl. Place the cauliflower and the soba into the serving dish and toss or turn them until the sauce is dispersed throughout the dish. I found it difficult to imagine that a noodle dish served purposely cold could be appetizing but, at some point in my life, I felt I just had to try soba in a Japanese restaurant. It was served with a dab of wasabi and a saucer of soy sauce and I never forgot how good that combination was. So when I began trying to think of low glycemic index foods, and found out that soba made with buckwheat and whole wheat flours was slightly lower than whole wheat spaghetti, I began to experiment with it. Later, I found out that buckwheat is also high in magnesium, and magnesium may be a helpful nutritional supplement for Type 2 diabetics. The two recipes in this post represent the most successful soba dishes I have made up until now—one served cold, the other warm. To further lower the glycemic index of these dishes I added a significant portion of a vegetable that complemented the seasoned soba. The French beans, if not overcooked, are crisp and delicate served cold and their slight sweetness is a contrast to the spicy saltiness of the soy-wasabi sauce. The cauliflower absorbs some of the pesto, providing many small bites of intense flavor among the warm noodles.